Learning outcomes: Students develop skills for creative problem solving; students understand that entrepreneurial behavior can take place within many contexts (new ventures, associations, government agencies and existing businesses); students are able to recognize and analyze business opportunities and social problems. Learning outcomes: Introducing entrepreneurship, discovering opportunities, business planning, effective business model, ethical and social foundation, financial viability, acquiring financing, marketing issues, building a team, preparing for growth, strategies for growth. 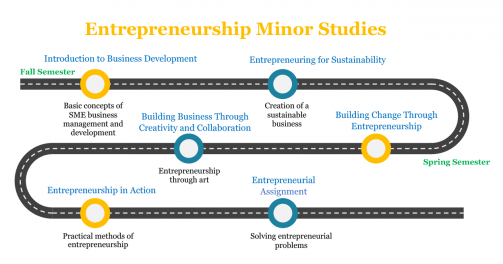 Learning outcomes: Upon completion of the course, the students are able to apply the core competencies of his/her studies in a real life entrepreneurship context. Students are able to realize and start working with a business opportunity or social problem in practice to find a solution. The student will improve his/her entrepreneurial skills; multicultural group working, problem solving, communicating and presenting. Students choose one of the Business Kitchen’s Programmes; Demola or Avanto Accelerator to entrepreneurship in action course. Learning outcomes: Students are familiar with basic business concepts and theories in SME context. On successful completion of the course, students understand the business development process from opportunity recognition to a launch and development of a sustainable business. The students are able to identify basic business processes in practice. Learning outcomes: Upon completion of the course the students are familiarized with entrepreneurial activity in society and possess skills that help to solve entrepreneurial problems and make change. Students will have an insight into the diversity of entrepreneurship and gain understanding of the specific aspects of entrepreneurship. Learning outcomes: Upon completion of the course, the student will be familiarized with concepts of learning, collaboration, creativity and emotions. The student will explore entrepreneurship from the perspective of artistic process, experience and learn the process of artistic creation in teams, experience and analyze emotions, such as uncertainty, frustration, enthusiasm and joy alone and in teams. The students will produce a piece of art as an outcome of the course workshops, and organize and host an art exhibition together.